1. Working out. I told ya, and I'll tell ya 100x I love barre!!! Such a great workout! Had to get in 2 classes before the madness and yumminess of 4th BBQ's! So glad I got outta bed and hit the gym! 2. Never enough opportunities to use my micro-plane or zester in the kitchen! I needed it for Julia Child's lemon & oil dressing for the pasta salad I was bringing to the BBQ - it's so good and refreshing! Plus in teh heat one should never use ingredients that need to be refrigerated - like mayo - people will thank you when they don't get sick! 3. Saturday afternoon adventure with the Hubs! Got a flat tire on my bike on our ride over to Big Star - laughable but walking with your bike isn't as fun as riding it! 5. Fresh cut Italian flat leaf parsley from my little patio garden - anyone need some?! I have more than this still growing! So, yes a fantastic looong weekend - so necessary! How were your 4th's and weekends? 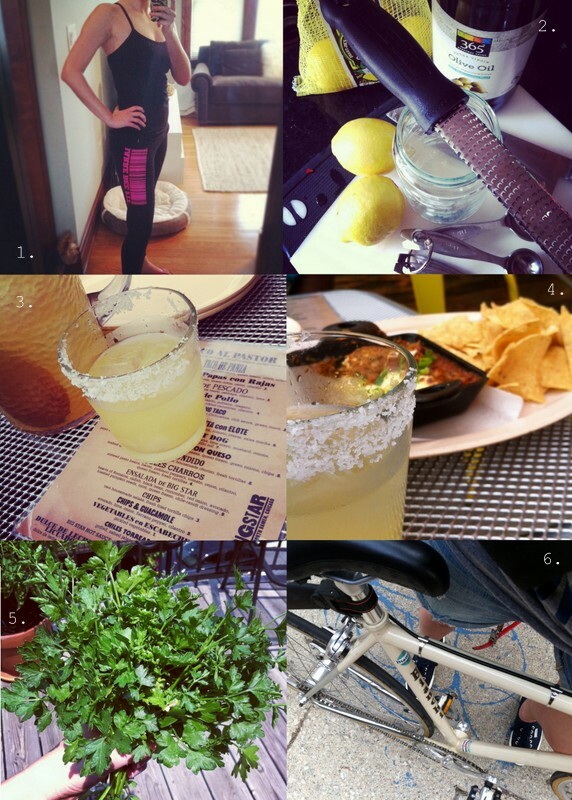 yes for margs and bike rides!! we're considering buying a couple-a used ones. do you mostly ride in the city? i'm thinking there must be some good trails a little further north. Parsley and girl date soon?!?!!!!! Whattta bout brunch next sunday? I have to teach barre at 1030, so if you don't mind me sweaty and hot-mess-looking I'm in! My microplane saves my life on the reg and if you could just send over a marg right about now that would be faaaaantastic. Mondays are woof. That Big Star photo you posted on Instagram had me instantly craving some tacos! !